Want to transfer your other media files, like movies, audio books, ringtones, etc? Now, with PhoneTrans, you can freely add, delete and extract those media files to your PC & Mac. This transfer software also handles your Camera Roll, so that you can import and export your precious photos. 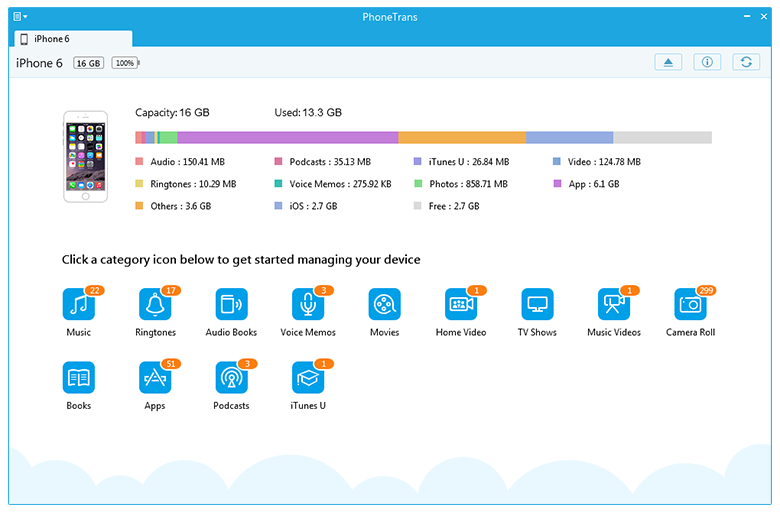 In addition, it's also handy to backup your multiple apps to your computer and install an app onto your device. How to Transfer Movies, Ringtone, and Other Media Files to Your Device? Step 1: Log in PhoneTrans on your computer after connecting your device. Then, choose the corresponding media column to continue. Step 2: Pick up some or more items, and click on the top-right corner to start transferring your target files. You can also drag-and-drop files to your iPhone (iPad, iPod touch). How to Transfer Movies, Ringtone, and Other Media Files to Your PC & Mac? Step 1: Connect your device to computer while launching PhoneTrans. Next, choose the destination files to go on your further operation. Please keep in mind the storage path while extracting files to your PC & Mac.